It was my baptism of fire. My first foray into the dramaworld. And the one drama responsible for this (terrible) drama addiction and he was the knight in shining armor. His rich-arrogant-handsome male lead character has since then spawned so many others until today. He has been hailed as the “idol king” so for this reason I choose him as my number one. He has then starred in many other idol dramas including The Hospital, Starlit, Hotshots, Down with Love, My Splendid Life. He also starred in movies Magic Kitchen and Hua Yang. He may not be a “great actor” but in many ways he moves me. I admit that when I first saw him I was like meh, he’s not that good looking. But the drama was so good and his chemistry with Chen Xiao En so amazing that I eventually liked him. In my opinion he is a good actor. He commands the screen with his intense acting skill although at times his choice of drama are funny (see Zhong Wu Yen, The Magicians of Love) but never a bad actor. His other roles which I like are Ying Ye 3+1, Beauties of the Emperor (with CQE) and Happy and Love Forever (with Annie Chen). I actually first saw him in Bullfighting (with Hebe and Mike) but his role was a minor one so I did not notice him then. It was only when I watched Volleyball Lover that he got my complete and utter devotion and since then I have watched all his other works including Momo Love, The Kid from Heaven and I want to Become a Hard Persimmon. Ok, I admit that it was not his acting chops which got me hooked but his looks. Damn, the guy looks so good. I fell even harder when he did The Queen of SOP (with Chen Qiao En) as Gao Zi Qi which I’ve watched a dozen times. Eddie is one of those with rare talents. He can really bring justice to the character he plays (Jump Ashin, Tai Chi Hero, Cold War). Nowadays, he is doing more movies than dramas which is good because he can become a bigger and better actor than he already is. He starred opposite HK veteran actor Nick Cheung and was able to shine. I loved him as the mischievous Yang Qi Lang and the adorkable Tian Kuo in Hear Me (with Ivy Chen). 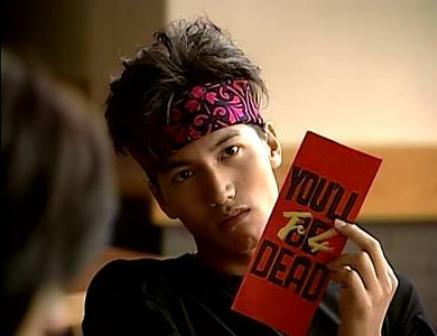 I don’t know why most of his characters are the best friend of the female lead (In Time with You with Ariel Lin) where he defined the perfect BFF/Boyfriend for me. I practically fell in love with him myself in the drama,which won for him a best actor award. He was also the perfect bestfriend to Xia Hong Guo (with Ivy Chen) in Modern People. He’s got the boy next door, campus nerd, regular guy to a T.